This piece was originally published by our friends at LaurenConrad.com. I'll be completely upfront with you: I’m the type of person who will get under-eye circles and bags almost immediately if I’m not caught up on my z’s. Whether I’ve had a late night out with girlfriends or have been burning the midnight oil for work deadlines, my eyes are always a dead giveaway for how much sleep I’ve been getting (or lack thereof, for that matter). I recently started noticing how tired my eyes were looking in photos, and I wasn’t happy about it… so, I decided to do something about it. A beauty experiment, if you will! After all, they say your eyes are the windows to your soul, and no one wants such an important facial feature looking rundown, fatigued, and dull. After a bit of research and a week of trying out five different tips and tricks, I’m pleased to say that my experiment worked and my under-eye bags had mostly vanished. I’ve been receiving compliments everywhere I go on how rested I look (probably because I am! ), and those who know me best (like my mother) have told me I should just keep doing whatever I’m doing because it’s making my eyes look brighter. Pretty cool, right? Little did I know how much of a difference a few extra hours of sleep each night, upping my h20 intake, and a natural beauty remedy or two could make in my appearance. Pretty amazing, right? Do you see the difference? Note: I don’t have an ounce of makeup on my skin or under my eyes in either photo, just a bit of mascara. I know this sounds obvious and it’s because it is… But this first tip is the most important if you really want to change how well rested your eyes and skin look. Ready? Here it is: Get. More. Sleep. In retrospect, I now realize I was racing through life with an average of about six hours a night. Take a look at the "before" photo above to see the effect this had on my eyes and skin. I would busy myself each night with emails, events, or unimportant to-dos around the house until about midnight when I would force myself to get in bed. And I would then wake up at 6 a.m. to make sure I got my workout in and I would stay extremely busy all day until midnight. Then the cycle would repeat. I was doing this to feel productive, and on the one hand, it worked, but at the end of the day, I ended up feeling more fatigued because I wasn’t prioritizing sleep. Nobody’s body can perform to its best ability if it’s rundown all the time. So, I made a huge effort to be in bed between 8:30 and 9:30 p.m. every night. You read that right—every night. I was fighting off a cold at first, so I found I really needed that extra sleep, but even after recovering, I continued to get to bed around 9:30. 2. Replaced Coffee With Green Tea. Ever heard of adrenal fatigue? I was basically a walking example of it. This condition is common in us millennials—it’s a state of lethargy and stress brought on by overexertion and overworking. And, as I’m sure you can imagine, caffeine consumption does not help here. So many of us rely and even depend on our morning cup of coffee to perk us up after a night of little sleep, when, in reality, getting the extra sleep is all we really need to feel energized. In order to stick with my goal of getting more shuteye each night, I vowed to swap out coffee for green tea during my experimental week. Green tea has a bit of natural caffeine, but it’s much lower than coffee and left me with a more stable, less buzzy energy boost after drinking it. This was a hard one for me to do, but I noticed that it helped tremendously with my goal of sticking to a bedtime and sleeping all the way through the night. Not only was I sipping on green tea during my week, but I was also chugging water. We’re talking three liters a day. (I’m a very active person, so this amount was right for me, but it might not necessarily be right for you. Click here to find out how much water you should be drinking daily). I stole this little tip from Lauren herself: The way I "tricked" myself into drinking enough water each day was by making myself drink one liter before each meal. So I would drink a liter of water before breakfast, a liter before lunch, and a liter before dinner. Easy-peasy. By day three of doing this, not only were my under-eye circles way lighter, but my skin looked fabulous and my pores even looked a little smaller, too. 4. Cooled Off With Cucumber Slices. This trick seems like an age-old cliché… The kind that brings to mind 1960s magazine photos of glamorous ladies lounging poolside with cucumber slices on their eyes. But let me tell you—it works. These tricks stick around for decades for a reason. Cold, freshly cut cucumber slices not only feel amazing on tired eyes at the end of the day, but they also act as a cold and hydrating compress, decreasing inflammation in the puffy or tired skin around eyes. During the seven days of my experiment, I put cold cucumber slices on my eyes every single night about an hour before crawling into bed. It only took 10 minutes of my day, and I found it to be such a lovely little self-care treat that I’ve been doing it ever since. I have been so happy with the effect it has had on me mentally and physically, that I’ve made it a regular staple in my nightly beauty routine. 5. Cut Out Refined Sugar. Now, this one was more to help my skin overall, but it is worth mentioning. Cutting out refined sugar is something I did when I went on my two-week skin cleanse (read more about that here), and I loved the results I got from it. This little dietary tweak helps to decrease inflammation in the entire body including the skin, which happens to be our largest organ. In short, sugar basically makes our skin age faster because it promotes an environment where collagen (the stuff that makes our skin dewy and plump) is more likely to break down, our immune systems don’t perform as well, and we aren’t as capable of fighting off bacteria. Knowing all of this, I cut out candy, sweets, sugary drinks, and even "healthy" sugary foods like granola and coffee sweeteners for a week. It’s incredible how quickly this seemingly small change can have on one’s skin. While my under-eye bags were lightening up by the day, my complexion started clearing up simultaneously too! PS: I also started using a new facial oil during my week that I have become completely obsessed with. It’s called Shea Terra Organics Rwandan Maracuja Facial Oil ($44). I highly recommend it, as I believe it helped contribute to my clearer, brighter skin. It's pretty amazing to look at my before and after photo and see the magic that these tips worked on my under-eye circles, not to mention my overall skin. I was even surprised by it myself when I saw the two photos together. If you look closely, the muscles in my face even look a little more relaxed in the second photo, and the whites of my eyes are way whiter. I didn’t realize that I was walking around with semi-bloodshot eyes all the time, and now I know I can blame it on the aforementioned lack of sleep and adrenal fatigue I was subjecting myself to. The sleep part of my experiment was pretty self-explanatory, but it was still amazing to see how quickly it changed my appearance. Basically, when we don’t get sleep, our body “traps” fluids under our eyes because the muscles have been overused by being awake for too long without resting. It’s our body reacting in an anti-inflammatory way, but it results in puffy eyes. So, to put things simply, getting more sleep cures this! I know it’s obvious, but this factor was the most effective during the week of my experiment. And I’ve been so much more motivated to get more hours of sleep each night ever since. Hey, they don’t call it beauty rest for nothing. Upping my intake of water (and green tea, which I replaced for coffee) was the second most effective factor in noticing these changes. When the body is well hydrated, there is less chance of water retention that can cause our under-eye areas to swell or get puffy. Avoiding dehydrating caffeine drinks and drinking more water combats this under-eye puffiness, and I sure noticed it. 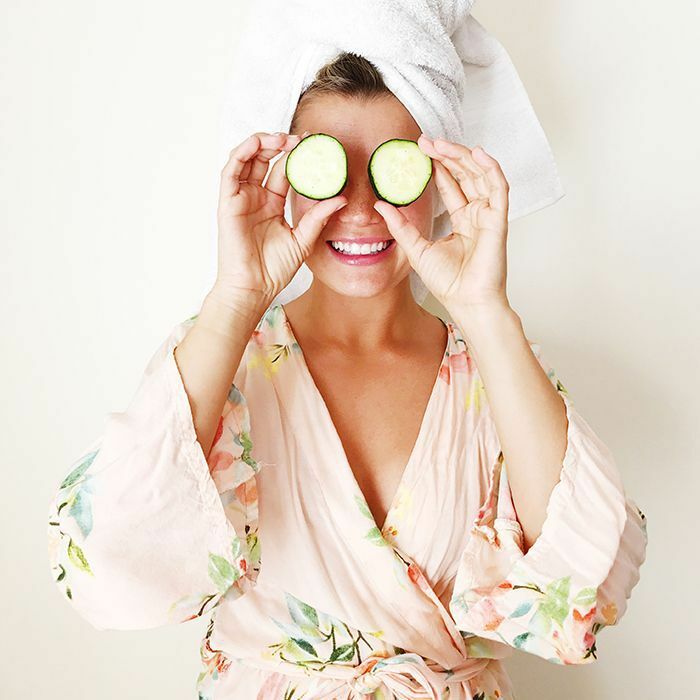 As for the cucumber slices, this water-rich veggie has enzymes and astringent properties that help reduce inflammation, tighten the skin, and hydrate—which is why this at-home mini spa treatment helps get rid of wrinkles and dark under-eye circles. I also truly believe that adding cucumber slices to my nightly beauty routine helped me to relax and unplug before bed, which therefore resulted in my getting a better night’s sleep (And therefore, brighter eyes! It’s a domino effect, you see…). As I mentioned above, I loved this part of my routine and have been doing it ever since. Do you have any tried-and-true tips for getting rid of under-eye bags and circles? Let us know in the comments below.